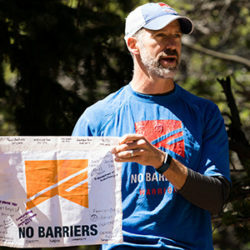 John joined No Barriers after more than 21 years as a United States Army Infantry Officer. He has experience leading soldiers in challenging situations around the globe. During his career, John served tours in South Korea and Egypt, and was deployed to combat in Iraq. His assignments included the 82nd and 101st Airborne Divisions as well as the Pentagon. He is a graduate of the rigorous U.S. Army Ranger School and is a Master Parachutist, Pathfinder, and Air Assault Soldier. He recently completed his final assignment as the Professor of Military Science at the University of Colorado at Boulder where he was responsible for training future officers for the Army. Most recently he was the director of Veteran Programs at Veterans Green Jobs a Denver based non-profit committed to helping veterans find employment in the green industry. Passionate about Veteran issues, he is active in numerous local and national veterans organizations. Additionally, he is on the board of advisers for impossible2Possible – a youth leadership development organization. He holds a Masters degree from the prestigious School of Advanced Military Studies (SAMS) at Fort Leavenworth, Kansas. He is Wilderness First Responder and ASIST certified and a registered guide in Rocky Mountain National Park. A devoted husband and proud father of two boys, he resides in Boulder, Colorado with his family. When not at work, John enjoys cycling, being outdoors, and traveling the world.